It's quite catchy lol minus Snoop. This is one of the tracks that made the End Of Year Top 100 Singles list that next to no one will be able to recall by title instantly (if they've even heard it). It's really catchy though with the way the title is repeated in the chorus. The beat is a bit generic but does the job at least. It's an average, pointless dance track until the inclusion of Snoop, at which point I begin to hate.<br><br>Edit: This grew on me. If not for Snoop, I'd actively like this and would chart it. One of those absolutely forgettable dance tracks but it's not horrible. Depending on how you think of it, Snoop both saves and ruins this track. Yay, it took me a while but I've finally heard this :P<br><br>Average.<br><br>Edit: Growin' on me. 3. Good song, nice beat. I am actually surprised this has charted. Hopefully it can get higher. Erfüllt seinen Zweck - der Beat ist auch ansprechend - und Snoop nervt auch nicht mehr als nötig. David Guetta has been using this sound for the last couple of years. Obviously Ian Carey decided he wanted a piece of that cake! Not bad, but unoriginal. 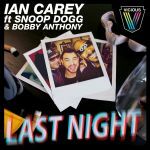 ▒ Géén hoogvlieger, maar ook géén bagger, deze samenwerking tussen "Ian Carey, Snoop Dogg & Bobby Anthony" uit eind januari 2011 ☺!!! Het truukje kennen we al langer van David Guetta, maar deze poging van Ian Carey is toch best leuk. Vooral het stukje Snoop is vet. geen hoogvlieger inderdaad, maar ook geen bagger! Es grüßen BEP. Die Dogge ist sowas von unnötig. Lange nicht auf Get Shaky-Niveau, Snoop Dogg ist unnötig und das Instrumental ist auch etwas zu eintönig. Eww eww "Where's the bathroom coz I really really gotta pee" I ask why did this need to be put into a song?? Super cool track.<br><br>Peaked at #5 on my personal chart.<br><br>Came in at #37 on my TOP 200 OF 2011. Hebt sich nicht aus der Masse. Alright, a different type of song. Bad! The production is the only thing saving this from a 1.<br><br>Don't understand why so many give this a good review. Disgusting lyrics especially the line "Where's the bathroom coz I really really gotta pee". I hate the Snoop Dogg rap as well. One of the worst dance songs if not the worst of 2011! This has a catchy sound but the message really saps the enjoyment. Still annoying 2 years on. At the point of Snoop spelling D-O-G-G I'm over it. Thanks to the production I'll be generous regrettably with a 3*. Terrible. "Get Shaky" is so much better. Gut! Hört sich tatsächlich so an, als es auf "One More Love" (2010) von David Guetta gehören würde, wohl eher also: "David Guetta ft. Snoop Dogg & Bobby Anthony - Last Night"! 4*!